Waterproof, Fire Resistant, Termite proof, Durable, Hygeinic , Easy to clean. From our wide consignment, we are offering to our patrons an optimum class variety of Monkey Dustbin. Storage Capacity: 6.2 Cu. Ft.
We are offering Monkey Dust Bin to our clients. 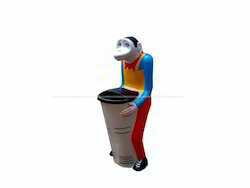 Monkey Dustbin, Size: Height 3'.6"
I am manufacture for monkey dustbin.